In today’s episode, Tim is joined by Jim O’Donnell, the author of the ‘Kill Your Color Wheels’ blog. 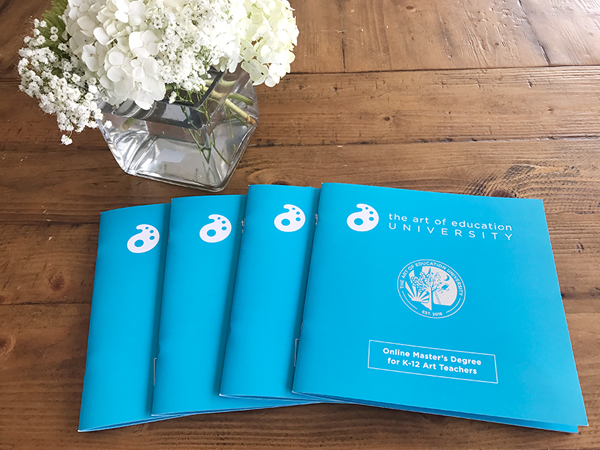 In a wide-ranging discussion on creativity and art education, they go back and forth with their ideas on where art teachers should focus their instruction (6:15), the importance of reflecting on what we do in our classroom (11:45), and assignments that help push our students’ creative thinking (21:00). Full episode transcript below. Welcome to Art Ed Radio, the podcast for art teachers. This show is produced by The Art of Education and I’m your host, Tim Bogatz. Well here we are. It is my first episode without Andrew. As you may have heard, last week was Andrew’s final episode after two years. I’m going to miss him, but it’s going to be fun as we move along here. We’ll get him back on every once in a while to come chat, come argue, come have some conversations, and it should be a good time. But as we move on here, I was trying to think where to we want to go with this first episode post-Andrew? I’ve been teaching the Creativity In Crisis graduate course lately, and it’s really got me thinking a lot about creativity, about what that looks like, about how we can implement more ideas for teaching creativity in our classroom. My guest today is going to be Jim O’Donnell. Jim does a great blog called Kill Your Color Wheels, which is first of all the most amazing title, and secondly has some great ideas about not only big picture things with art education, but also some smaller scale things about how we teach creativity. 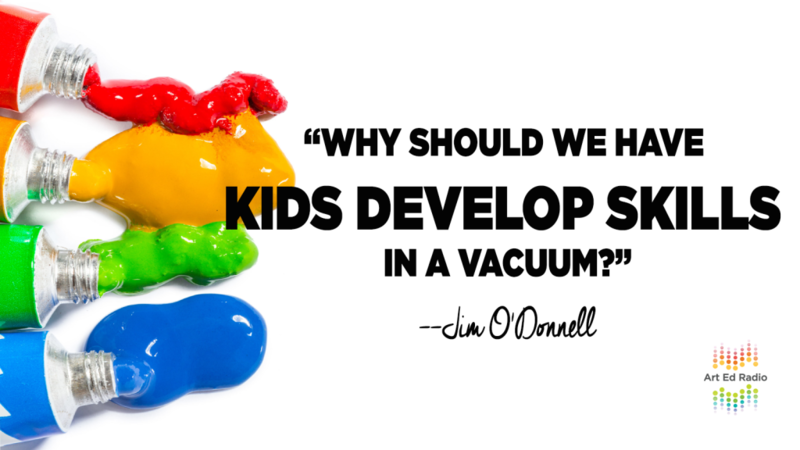 About how we can develop our kids to be more creative thinkers. I want to talk to Jim about a lot of different stuff. He is a big thinker as well, and I want to kind of pick his brain. Something that he and I have been talking about off-air is just the idea of how do we help art education thrive. It’s being cut so many places, and so many places we’re just trying to survive. How do we move from making it survive to making it thrive? So we’ll dive into that a little bit, and just kind of chat about how do we approach that as art teachers. How does Jim in his job … He teaches future art educators. He works with a lot of pre-service teachers. How do you teach them to do art education a new way, an inventive way to make that thrive? There’s a lot to look forward to this conversation. I think it’s probably going to take a while, so I’m going to bring him on here in just a second. I hope you’ll dive into some of these ideas with us, and I hope you’ll enjoy the show. With that, let me bring on Jim O’Donnell and get this conversation started. All right, I’m here with Jim O’Donnell. Jim, thanks for joining me. How are you today? Jim: I’m doing fantastic, thanks Tim. Tim: Good good. I just want to dive right in with a big question. 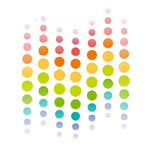 The name of your blog, which I love by the way, is Kill Your Color Wheels, which is spectacular. Obviously a nod toward doing things differently in art education. If I can ask you now, what about the traditional style of teaching do you want to change or think needs to change, and why do you think those changes need to be made? Jim: Yeah, absolutely. Kill Your Color Wheels, that’s based on a quote, kill your darlings, which is supposed to be good writing advice. For me the color wheel is definitely one of the darlings of the art education community. For an author, this advice means that in order to advance your story or in order to advance as a writer sometimes, you have to be willing to sacrifice even your favorite characters. If you’re a fan of Game of Thrones, then you know that George R. R. Martin follows this advice really, really well. For me, why is the color wheel something that I want to kill? The color wheel is emblematic of something called the school art style, which I think is one of the biggest persistent enemies of creativity in art classes today. I would love to see art education kill the school art style once and for all. It’s something that art educator Arthur Eflin identified way back in the 1970s to describe cookie-cutter art activities, where it’s the teacher making the creative decisions and the students just basically following instructions and finishing nearly identical work. If you basically know what the results are going to look like before the students even start, then it might not be a very creative assignment. I know that some people are thinking those kinds of assignments are important for building skills. For me, I would ask why should skill building occur in a vacuum isolated from meaning? For me, meaning is always the most important thing. For me the color wheel represents that kind of formulaic teaching approach where it kind of misleads students to believe things like there’s a one-to-one relationship in art, like blue is a sad color, or that there’s a right and wrong way to use color in art. For me, these things are more anti-art. In the first case, things in art are not like equations. Blue can be a sad color, but so can other colors. Saying blue is sad defies research and common sense. A blue sky doesn’t usually make people sad. In the latter case, art teachers often teach color harmonies as if they’re rules rather than suggestions. I love color, but color is highly personal and often influence by culture and almost never universal. I think color optics and science are fascinating, but when art teachers are judging what’s good or bad in art, I think that’s different and dangerous even. If they could decide what’s good or bad in art, maybe they should be an art appraiser for some auction house, or a curator of a trendy gallery, because they can’t even figure that our half the time. For me, I just want art educators to focus more on experimentation and process rather than elements and principles. Art is for me, not about memorizing lists of facts or right and wrong way. It’s more about subjectivity. It’s not about content, but creativity. These are mistakes I’ve made. I’ve only learned things the hard way. I’ve had my students paint color wheels, and for me it was a complete waste of time. There are infinitely more valuable things that they could be doing in art class. 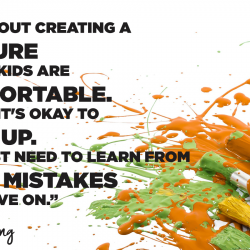 For me, it’s a reminder to take risks and help my students take risks, and hopefully something to encourage other teachers to try and be vulnerable and think more like artists in that way. Tim: Yeah, I think there’s a lot of good points there. I think people who listen to this podcast know that your thinking and my thinking tend to line up on a lot of those things. I rant all the time about how perspective lessons are not teaching kids anything. We need to be reflecting on those ideas and always looking for new things. I guess I want to talk a little bit more about that, because I know in your job you’re teaching future art educators. A lot of pre-service teachers. Along with everything you listed, or in with those things that you listed, what are the big ideas you’re trying to get across to who you’re teaching? For future teachers, what do you think are the most important things they need to know? Jim: Yeah, that’s a good question. I’m definitely thinking about really big ideas a lot of the time, so it’s really hard to say with any certainty what art educators are going to need to know in the future, because we don’t know what the future’s going to look like. What are artists going to need to know in the future? Or anyone? It’s kind of a toss-up sometimes. What is art and creativity going to mean in a world with AI and robots and climate change and Jeff Basos and all these things that we just have no idea what it’s going to mean? For me, I think what can I as an art teacher do to prepare my students and teachers for an uncertain future? The question basically answers itself. Uncertainty. That’s something I discovered in the last few years. Uncertainty is central to creativity and art. What I want my future art educators is to be open to uncertainty and try and work that into their plans even. To be open to being wrong and even embracing failure. I know when I started out as being a teacher, I was very resistant to the idea of admitting that I was wrong in front of people. That felt too raw and unsafe, but now that I’ve been doing it for a while, I’m much more comfortable doing that. I find that my students respect that and we learn more from each other that way. In their classrooms, my future teachers are going to have to make choices and take risks when the results are far from guaranteed. That’s what just working with people. That’s what it’s like to make art. These things are true about life. When students are learning about art, what they’re really learning about is life. There isn’t really anything that’s much more important than that for me. I want them to be thinking long term. There’s what I’ll call the one thing. I got this from my mentor Dr. Craig Roland at the University of Florida. 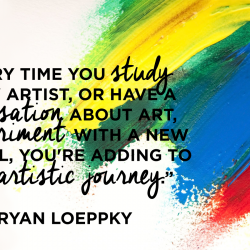 What he used to do, is he’d hold up his index finger in front of us and ask, “What is the one thing you want your students to remember about their time in art? What will they remember about their time with you in five or ten or even 20 years from now?” And it’s probably not going to be much if we’re honest with ourselves. How much do any of us remember about any of our teachers? So whatever that is, whatever you choose for that to be, try and make it something important. That is the foundation of backwards design that you begin with the intended transformation in mind. For me, the most important transformation is that my future teachers see themselves as creative and realize that everyone can be creative, and creativity can be practiced and improved. But above all, I think what I want my teachers to remember is that they teach people and not art. That’s what I learned from my other mentor, Dr. Melanie Davenport. She taught me to teach with my heart and to be authentic and to be a goofball. This gives my students permission to be themselves. The most important thing for students to know is that their teacher genuinely cares about them, and she has always taught with a tremendous amount of love for her students. At the end of the day, I want my teachers to be inspired to inspire. I’ve seen the transformative power of art and I want them to see that as well and help bring that about in their own students. Tim: Yeah, I think that’s a lot of really good ideas and a lot of big ideas. I guess what I want to ask you about with those is, they’re not necessarily specific to pre-service teachers. I guess the question is what kinds of ideas, or where do you think people who are already in the classroom can improve and start working with some of those ideas that you’re talking about? Obviously reflection is a really vital part of how we improve our teaching, so what do you think that we should be thinking about in regard to what we do in our classroom or what we do with our students? What should we be looking at specifically in order to become better at what we do as teachers? Jim: I think it’s vital, first off, that we look at artists and allow artists and makers to be our role models as much as possible. When we’re planning for our classes, we need to ask ourselves I think, what would an artist do? Or, what would an artist do in this situation? One example that I love is an artist by the name of Oliver Herring. He was featured in our 21 series, and his artistic practice involves performance, video, and photography. He uses these to connect with other people, and often complete strangers. He travels all over the world doing this. It’s about ways of discovering how to live in the world with other people using art-making. I think it’s fabulous. One specific example I’ve seen of this are these task parties that he plans, which are these temporary gatherings of individuals with very limited materials and very limited direction. This allows for very spontaneous interactive and communal creations that exist for a short time and then go away. There’s something really beautiful about that. I’ve experienced this at a recent NAEA convention, and I’m looking forward to experiencing more of them. I just think they’re fabulous. For the art teacher or any teacher I think, the idea is instead of every student working on the same assignment in unison, in that kind of factory model, when our students show up I want art teachers to be thinking what can we do together? What’s possible with 20 or 30 students that’s not possible with one or two or five? Rather than just scaling up something. I also think we can be looking to sources and resources in art education and experience in education, but outside of those fields as a whole. For example, I really love author and social worker Brene Brown. She writes a lot about her research on vulnerability. One quote I pulled out that I like is that, “Vulnerability is not about winning or losing. It’s about having the courage to show up and be seen when we have no control over the outcome.” For me, that sounds like teaching. It’s not about winning and losing, and learning’s not about winning and losing, but sometimes it feels that way. We don’t have a lot of control over the outcome necessarily, but I think teachers are incredibly brave when they stand up in front of their students and they’re themselves and they’re focusing on what’s really important. I think we all can think about how we can embrace vulnerability and model that for our students so that they can become more vulnerable, and this I think over time builds inner strength and self-discipline. I think those are critical skills for art-making, but just life in general. I think you have to be vulnerable to be a better art teacher and artist. That might mean trying new things or allowing students to make more choices, or deal with more personally meaningful subjects, or starting a blog. Putting yourself out there in some way and stepping into that discomfort is I just think critical for art teachers to be thinking about. I think whenever you’re affirming life and celebrating life, I think that’s what art and teaching is all about. Tim: I think that’s really well said. I think a lot of what you’re talking about sort of lends itself a little bit more to creativity and wanting to have students who are more creative. I know you’re passionate about that. I guess if I can ask you, why do you think creativity is one of the more important things we can do in our classroom, and why do you think it’s just vital for kids to learn to be creative? Jim: Think creativity is our game, that’s our thing. Creativity is one of the most important things we can do in our classroom, not least of which because it’s something that the other classrooms aren’t really thinking about at all. We know how important it is. But school tends to be focused on, from my point of view, extremely short-term goals and often applies methods that actually contradict those goals. A lot of school promotes conformity, dependence, competition, and those things for me are anti-art. I don’t know how you win at art. Or in the art world, if you’re an artist, I don’t know what 100% looks like or an A. I just kind of bring that back to the classroom. I want students and ultimately my teachers to work on risk-taking and experimentation. Pushing your boundaries, because that’s learning. I want to get to the root of art-making and thinking and artistic thinking, and for me that’s creativity. It’s valuable regardless of whether you want to make art, or your art is singing, or your art is dancing, or even if you don’t want to make art. I think creativity is one of those skills that’s going to help someone regardless of what career or field they want to go into. There’s creative ways to do anything at all, but what I see instead of that unfortunately sometimes, is I see more and more testing and grading in art classes. I see that just because you can grade something in art, doesn’t always necessarily mean that you should or that we have to do a lot of grading to demonstrate vigor or to make ourselves more appealing to people outside the art room. I think what we do is really powerful, and we shouldn’t be focusing on lower-order thinking like memorizing lists of elements or spitting back vocabulary, because that short-changes what we do in people’s minds. I think creativity should be the foundation of what happens in the art room because that’s the foundation of art for me. It’s something that … I don’t know what the future will bring, but I know creativity is going to be really, really important in navigating it. It’s something like I said, that I think you can apply to most any area of your life. You can apply it to your career. You can apply it to so many different situations, and it all just begins with a really simple question. I wonder. I wonder if, or I wonder how. I think art class can be the place where wonder lives. That’s something that we can own. Tim: That’s really, really well said. If I can follow up on that. I think you’re speaking to a lot of ideas that art teachers have about what art class can be, what it should be. 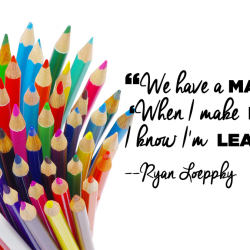 I feel like we pay a lot of lip service to teaching creativity, but I don’t know that there’s enough talk about how we can teach our students to be more creative. Can you share maybe some concrete strategies or ideas that you have, or things that teachers can use in their classroom to improve how they teach creativity? Jim: Yeah, absolutely. I’m happy to share a couple of concrete strategies. Something I came across rather recently actually, is that creativity sort of paradoxically requires innovation and imitation. There are models out there and practices that we can imitate in order to achieve more innovation. A couple of those that I’m thinking of are like I said, using artists and designers as role models. If you look to artists in studio practice, one constant for artists is that they work in series. That they work in repetition. That they often find something that interests them and inspires them, and that can come from anywhere of course. But whatever that is, whether it’s the way that they apply paint to a canvas, or whether it’s ideas about something from life, they work with it and turn it over, over, over again and really try to squeeze all of the juice out of this that they possibly can. Not to come to some kind of final answer or resolution, but just to explore it as deeply as possible and scratch that itch that they have emotionally or intellectually. In the classroom, the question is how do we get our students, how do we get them to work in series? To work with an idea in multiple ways and seeing it from multiple angles. One assignment I like to give students is something like 25 variations. Take an object … This is sort of a more traditional maybe example, but you choose an object that’s interesting, and you deal with it in 25 different ways. Students usually have a lot of headaches by number 10 or number 15. But once they break through that barrier, you start getting some really interesting results that are a little more unexpected. That’s the challenge, often, is how do you help students break through their cliché thinking or knee-jerk reactions to things? That’s what art helps people do. With designers, that’s another great example, it’s a little different, though. With designers, there’s something called design thinking. This is an idea that you can find online with lots of resources available. The idea is, there’s this model that is based on what designers do. When designers, say for example, are trying to design a more comfortable chair, they start with this problem or this intention, and they ideate. They create lots of different ideas and solutions to the problem, and then they prototype them, and they test them, and go back and revise and try again. That for me is another great example of a model that we can transport directly into the classroom, and a lot of teachers already are using this model for really exciting results that get their students to collaborate and think more creatively altogether. Those are two examples, one from studio art, one from design. Something else that I’m really interested in these days that I don’t mind talking about for a little bit is the idea of systematic creativity. This is something that maybe is a little bit counter-intuitive for some folks, but it’s the idea that success is a little bit more predictable than failure. Or, that you’re going to get probably more predictable results with successful examples than you might get with examples that don’t work. The idea is, it comes from a book called Made To Stick, which I love this book. It’s written by Chip and Dan Heath, and it’s all about why some ideas last and some ideas go away. They cite this research where they found that with advertising, this research group took 200 highly-regarded ads, advertisements, and they found that 89% of these advertisements fit into six categories. They tended to be simple or unexpected, concrete, credible, they had emotion, and/or they told a story. When they looked at 200 not-so-highly-regarded examples of advertising, they found that they could only classify 2% of them. It’s kind of like evolution. You’re going to have a lot more permutations and mutations and things that don’t really quite take off, than the ones that tend to stick around. They took this idea and they tried to see if they could actually teach it to people, and the results were really fascinating. They found that when they took a group of people and gave them no training, that those people tended to come up with some … And they test these again with consumers. They found that people who didn’t get any training generally kind of created annoying ads. When they took another group though … This is surprising. They took another group and they had a creativity instructor work with them and teach them mind mapping and some sort of brainstorming techniques that we’ve all probably used. I’ve used a lot of mind mapping. They found that consumers though that these ads were less annoying, but not really more creative. That was really shocking to me, because I’ve done a lot of mind mapping with students. They found that a third group, that when they taught them these principles, these six categories, they found that they were much more creative and much more positively received. This isn’t by any means conclusive research, just this one study, but it’s really promising in the idea that yes you can actually teach people to be more creative, but there’s various strategies to do this that are more or less successful. Those are three things that I’ve been thinking about recently I think, that I think can help anybody in the classroom if they’re trying to be a little more creative. Check out those resources, or some of those ideas. Tim: Yeah, for sure. I think that will be really good advice, good opportunities for people to look that up. We’ll make sure that we put links to everything there in the show notes so people can go and research. I have one last question for you as we wrap things up here. I know you and I have talked a little bit about helping art ed thrive, not just kind of survive where we are. I guess as some closing thoughts, what do you think that we can do as art teachers to imagine and to support a world of art education that is in fact, thriving? Jim: Yeah, that’s a really exciting thing to think about. I think an art ed that is thriving is when we’re being ourselves. Art should humanize education. I see all these examples of things that de-humanize education. The high-stakes testing. The teacher evaluation. The accountability movement, like I mentioned. All of these forces that we feel aligned against us, but for me it’s we don’t have to be like other subjects to justify our existence. That’s never going to help us I think thrive. It’s the other subjects I’ve always said that have a lot to learn from art class. They should be embracing the things we’re doing. They should be modeling after us. Making choices, encouraging play, uncertainty, collaboration, ambiguity, risk-taking, multiple points of view. These are all things that art does really, really well that I think other classrooms could be doing much better. Art is natural. What is natural for the artist should be natural in the art classroom. Art helps humans explore what it means to be human together. Art helps humans explore different ways of being, and we need a future with our humanity intact. In some ways I think this doesn’t mean that … Some people might think that to protect our humanity or to be more humane, we have to resist technology. For me, I think art education thrives when it’s high-tough and high-tech. That we need to help our students build their analog and their digital tool kits so that they can be empowered to express themselves on the digital platforms that will become increasingly relevant in their futures. Technology for me has always been a friend of art since they started putting paint in tubes. That allowed Van Gogh to go outside and paint landscapes. Or, the invention of the camera freed artists to paint however they wanted to. At the end of the day, I think art education is thriving not when it is producing artists or designers, because we know that most of our students aren’t necessarily going to become artists or designers or work in a creative field, but when we’re helping foster these creative communities and helping to produce adults that can think like artists. Creative thinking should be at the center of every art room, regardless of whether one practices choice-based or project-based or more teacher-directed styles of curriculum, students don’t have a lot of choices in school, but they can in the art room. Students don’t get to take a lot of risks in school, but they can in the art room. I think an art education that’s thriving is one that’s helping students imagine possibilities. Tim: Yeah, I think that like everything today is really, really well said. I think that will be a good place for us to end it. Jim, thank you so much for coming on. I really appreciate everything you had to say and all of your insight. Hopefully we can talk to you again soon. Jim: Yeah, I’d really like that Tim. Thanks so much. I was really excited to be here. Tim: So many great ideas there. So many great references that Jim dropped in our conversation. I will make sure we link to as many ideas as we can, and that will give you an opportunity to dive a little deeper into everything that we’ve been talking about today. Before we go, I want to talk just a little bit more about the Creativity In Crisis graduate course that I’ve been teaching lately. The one I told you about in the intro. It’s based around Sir Ken Robinson’s book called Out Of Our Minds. If we could all just take a minute to remember that Sir Ken Robinson was on this very podcast about a year ago. I can’t let an opportunity to brag about that pass me by. In all seriousness, this Creativity In Crisis course has been awesome. We started out talking about creativity in schools, the challenges we face in teaching creativity, and the challenges we face within the school system at large. Right now, we’re focusing on our own personal creativity. Taking ourselves on artist dates and defining more ways to develop what we do as artists, what we do creatively. Then in the final couple weeks of the course, we’re going to be talking about how to make our kids more creative, and we’re going to be taking some actionable steps to implement more creativity in our classrooms and our schools. As you can hopefully tell, it’s something that I’m pretty passionate about and something that I really enjoy working on. If you’re the same way, if you want to find out a little bit more about the course, if you’re interested, or if you want to sign up, we’ll add a link in the show notes when you’re taking a look at everything else. Or, you can check it our at theartofed.com/courses. There is a new section starting on March 1, then again at the beginning of April, and the beginning of May. I think that’s going to do it for me. I know this has been a long episode, and on top of that we’re giving you lots of homework this week. Check out Jim’s blog called Kill Your Color Wheels. Plus, check out the show notes that I mentioned on the website for links to all of the other great stuff we talked about. You can also check out the Creativity In Crisis course as well. I hope you take the chance to engage and dive in with at least a couple of those things. Keep your learning going, because that’s how we’re going to make art ed not just survive, but thrive. Art Ed Radio is produced by The Art of Education with audio engineering by Michael Crocker. Remember that you can sign up for our email list at artedradio.com. Find all of that awesome content I was just talking about, and listen to all of our old episodes including the one with Sir Ken Robinson. Thanks for listening and we will talk to you next week.